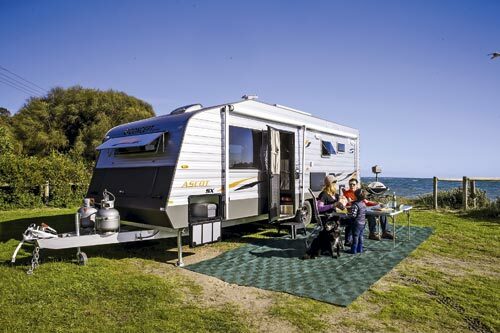 There are some caravans that just have that X-factor – the caravan park barbecue-stoppers that command attention when they arrive and immediately draw an appreciative crowd. The new Concept Ascot SX is one of a select few of these vans. Perhaps it’s the Ascot’s shiny bright silver upper-body aluminium cladding – a particularly attractive shade supplied exclusively to Concept by Camec. Or maybe it’s the sleek, tapered lines, starting with the long wedge-shaped roof and accentuated by the smooth, grey fibreglass lower sides. Or it could be the van’s imposing 9m overall length from coupling to the tip of its twin bumper-mounted spare wheels. Whatever the reason, you command respect with the Concept Ascot SX on your towball. Sitting on a tough 150x50mm SuperGal A-frame and main chassis with an additional 75mm riser beneath the body, and fitted with alloy offroad wheels and tyres, the Ascot looks tough enough to tame the Tanami but it is, in fact, designed specifically as a luxury bitumen burner. Its tandem Rocker-Roller leaf-spring suspension is ideal for this purpose, allowing the van to sit low and track perfectly behind a 3.5t-capable 4WD, aided by its substantial 316kg ball weight. And the standard Al-Ko Electronic Stability Control is on hand, should the tail ever decide to wag the dog. But it never got close on our test. The 22ft 6in (internal) configuration we tested saw it top the scales at 2738kg Tare. Walk around the Ascot, as everyone will do when you pull up, and you can see how Concept has used its nine years’ experience building more than 4000 vans to tick all the right boxes. Starting at the front, you’ll find excellent stone protection from the black body padding that extends halfway up the van’s front. Above that, surrounding the relatively narrow front window with its drop-down stone shield, is heavily-textured stone and hail-resistant cladding that extends over the wedge roofline to the van’s tail. A mesh tray on the lower A-frame further keeps stones at bay and is also a handy place to store hoses and the like. The large front boot houses the Ascot’s standard ProStar solar management system, which not only monitors the health of the twin 100Ah deep-cycle batteries via their Ctek smartcharger and shows you the gain from the van’s dual roof-mounted 135W solar panels, but also displays your current power consumption. 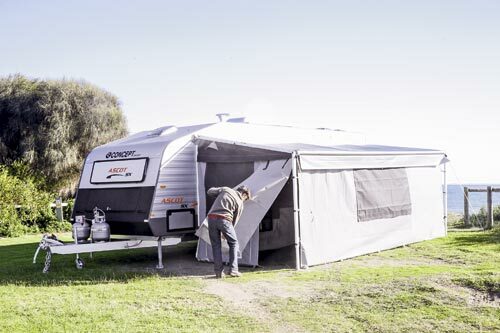 Move to the Ascot’s entry side and there’s a huge three-quarter tunnel boot, which is large enough to swallow tables and full-size camping chairs, with enough room left over for awning matting, folding chairs and, perhaps, a folding recliner. The centre entry door opens to reveal a large built-in step, but the distance to the ground is still enough to warrant a separate portable step. A sturdy, angled grab rail is fitted to assist entry and exit to and from the van. 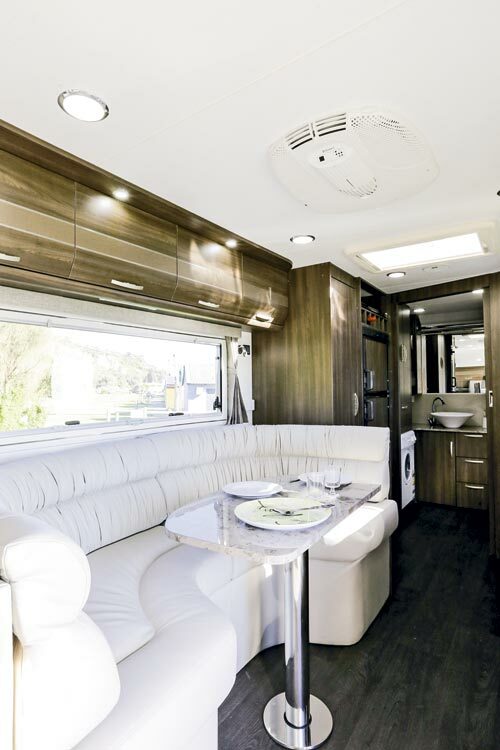 Further along the body is a quality drop-down picnic table and a hatch housing an external TV swivel mount and the necessary 12V and 240V plugs and wires to make it all work under the huge Dometic pull-out awning, which comes with a centre supporting strut for travelling. The offside of the van is fairly plain, apart from two large Dometic double-glazed windows. There’s a large rear hatch which is big enough to accommodate a 2kVA generator and a pair of drinking water jerry cans, or folding chairs for roadside stops. A low-mounted water filler simultaneously feeds the Ascot’s two water tanks, which have capacities of 60L and 80L. 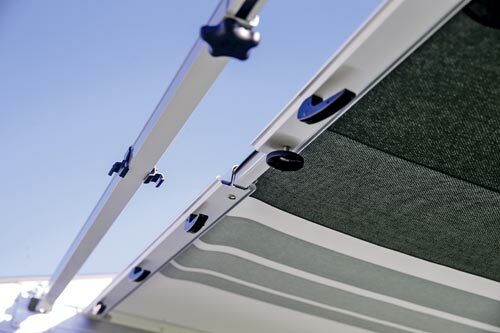 The rear of the van is devoted to a sturdy bumper bar to which twin 15in alloy spare wheels are mounted – handy protection in a long van, although the standard Waeco reversing camera should save you from embarrassment. When you step inside the van, the jaw really drops in appreciation. ‘Classy’ is an often misused term, but it fits the Ascot SX like a glove. The solid timber, computer-cut cupboards and furniture in our van was finished in the darker of two exclusive European timber-look finishes offered by Concept for their flagship – the ‘Victoria’ chocolate colour, with a matching timber floor, offset by a white ceiling and a plush, cream leather upholstered club lounge. It looked very smart, but those preferring a more ‘beachy’ look could specify the lighter Kirsch Scandinavian-look light timber finish and the more popular café-style dinette. 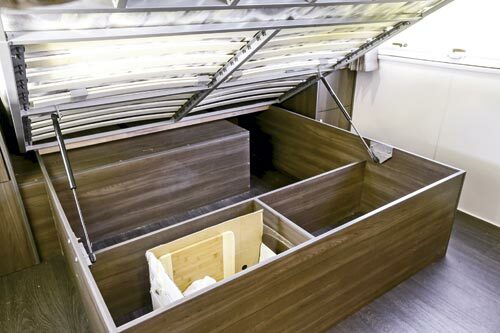 In both designs, the cupboards over the bed, kitchen and lounge have a smart contrasting centre panel, and those in the galley and lounge also have a curved profile created by a tricky manufacturing operation involving joining three separate solid timber panels to create the contour. A feature that distinguishes the Ascot from most other island-bed caravans is Concept’s preference that the lift-up queen-sized bed, with its substantial compartmentalised storage beneath, should have an open, inviting look, so there are large bedside tables with drawers below instead of mirrored-door flanking wardrobes. This gives the bedroom a modern, uncluttered look, but the hanging space is reduced to twin shirt, jacket or skirt-length robes located above the front-loading Dometic washing machine in the van’s rear ensuite. But, as the wardrobe configuration is the customer’s choice, they can choose to have wardrobes in the bedroom, or a longer robe above the washer by removing the drawer. Even though it shares space with the robes and washer, the ensuite is spacious and includes a large fibreglass shower cubicle and swivelling china-bowl Dometic toilet. The only downside is that it’s quite dark, with only small ventilation hatches above the toilet and shower cubicle. A central skylight would help here. 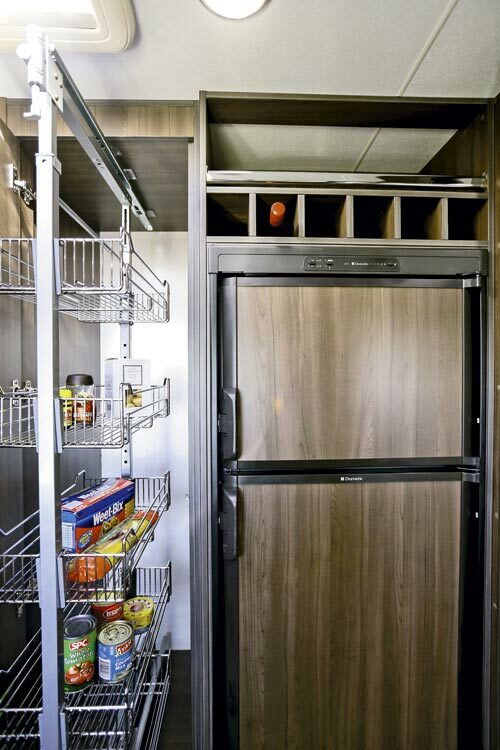 The very large slide-out pantry in the lounge, on the other side of the 184L automatic three-way Dometic fridge/freezer is a great feature, but the slide-out shelving doesn’t make maximum use of the available storage space. The kitchen is generally a very workable area, although bench space is smaller with the club lounge option than with the café-style dinette. 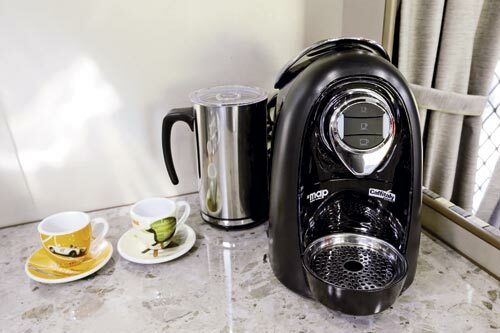 But with a Thetford three gas-burner and one electric cooktop, a grill and a full gas oven below, complemented by a Samsung microwave, there’s every opportunity to cook up a gourmet storm. 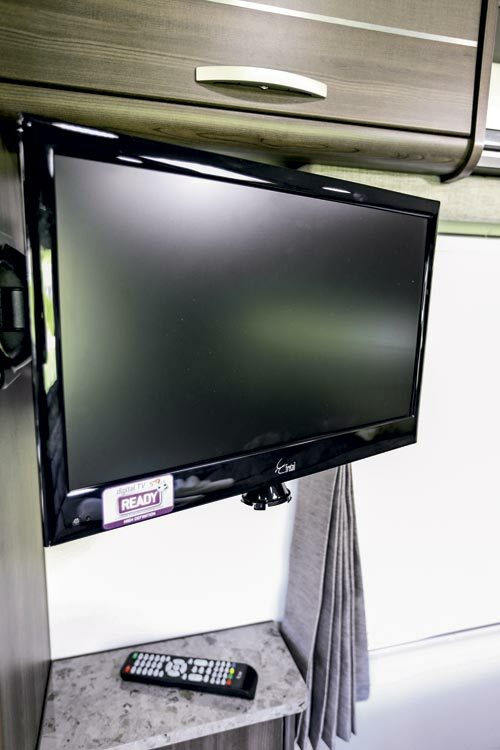 A separate tap for filtered drinking water, solid timber 25mm benchtops, quality and stylish cupboard furniture and first class fit and finish are all appropriate and appreciated features in this level of caravan. As is the club lounge, which uses high quality pleated leather. 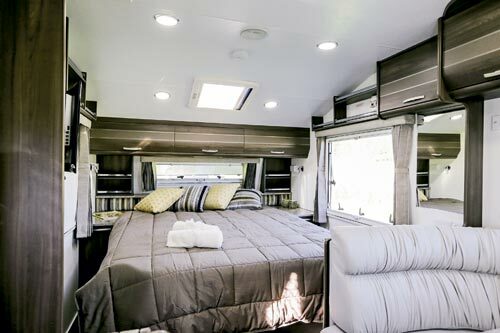 It is a great space for four adults to relax, each enjoying a commanding view of the 19in LED TV, which swivels to offer views from the bedroom or lounge. It can also be repositioned outside for those balmy evenings in warmer climes. 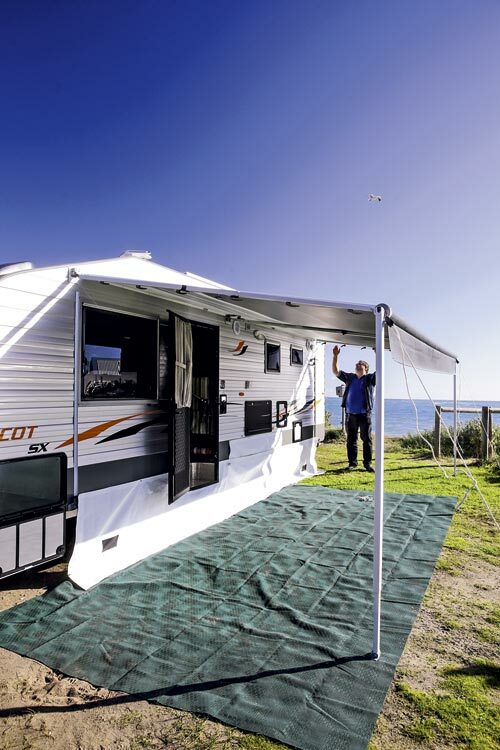 This review is really just a preview of the Ascot SX, as we will learn a lot more about this particular caravan and what it really is like to live with on our Far North Queensland adventure, which will take us to Cape Tribulation, Port Douglas and Palm Cove over a six-week period. It will be hauled behind the very latest 2014-model Jeep Grand Cherokee Overland and with its newly up-rated 3L V6 diesel engine pushing out 570Nm of torque, matched to a new eight-speed automatic transmission, they should make great travelling companions. Take a good look at the solid panel furniture in the new Concept Ascot range, because you’re going to see a lot more of it in other Concept models rolling out of its factory in Campbellfield, Vic, over the next 12 months. With an investment of around $500,000 in cutting-edge Italian CNC and dust extraction equipment, and an even greater commitment made in August last year to take a minimum of $500,000 worth of premium German BauschLinnemann paper coatings for each of two exclusive timber-grain plywood finishes, Concept needs to share the love across its full caravan range. 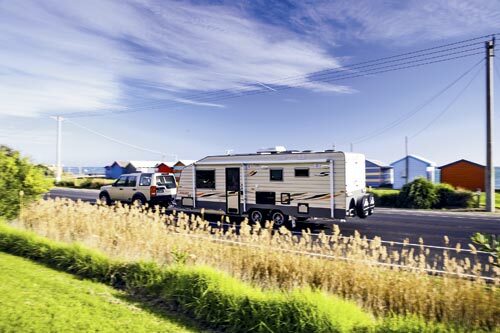 The advantage of the solid panel furniture versus conventional ‘stick’ furniture for Concept, as for the small but growing group of other Australian RV manufacturers making the investment, is a substantial reduction in assembly time. Being pre-cut, the furniture goes together quickly like a pre-cut domestic kitchen, but there are also significant advantages for customers, too. One is fit – with tighter tolerances, the interior looks more professional and, in Concept’s case, the Victoria (chocolate) and Kirsch (lighter, Scandinavian-look) timber-grain finishes are cutting-edge 2014 fashion shades that only they offer. The other user benefit is added strength with a minimal increase in weight but, be aware, not all flat pack furniture is the same. Concept uses 15mm thick Poplar-core plywood sourced predominantly from Spain and Russia, which is both lighter and stronger than the 12mm HMR (or chipboard) used in some other flat pack caravan furniture. Because it is thicker, it will hold a screw better and longer, particularly under continual flex over the life of the van. And, because it is lighter with similar strength, it works better than traditional stick in areas where it additionally serves as body bracing. The result is a quicker fit-out and a stronger van, with no increase in net weight. And with its tighter gaps and sleek finish, with stylish curved overhead cupboards in the case of the Ascot, it also looks impressive. 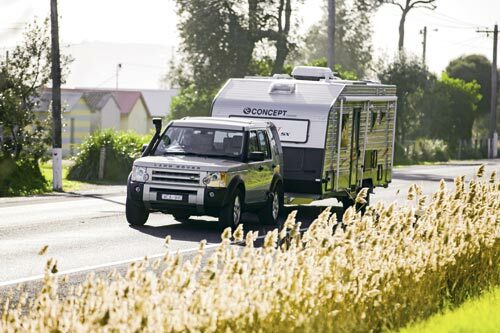 Concept first introduced solid panel furniture in its second-tier Vision series van last year and then extended it to the range-topping Ascots for 2013. 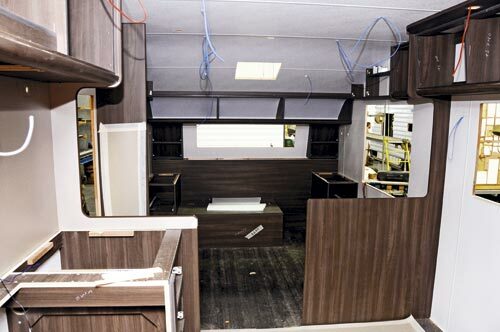 But Concept co-director Keir Smith believes public acceptance will ultimately see the solid panel Poplar ply employed across the company’s full caravan range in the short-to-medium term. For the past 18 months, the Ascot has represented about 15 per cent of Concept’s total production, but Ascot and Vision models with the new interior fit-out are expected to account for about 30 per cent of all Concept production in 2013. “We are already integrating some of this new furniture into our other traditional caravan models and this will only increase,” Keir said.